In my organization, our networked laser printers are mostly made by HP and we have a large number of them so anything to make managing them and their consumables would be a godsend. One of the things to manage them, HP’s Web Jetadmin, has been out there for quite a while but I finally got around to check it out. At this point, anything that can save time and make up for the under-staffing is very welcome. HP Web Jetadmin touts that it will save time, increase productivity, protect your investments, and reduce costs. 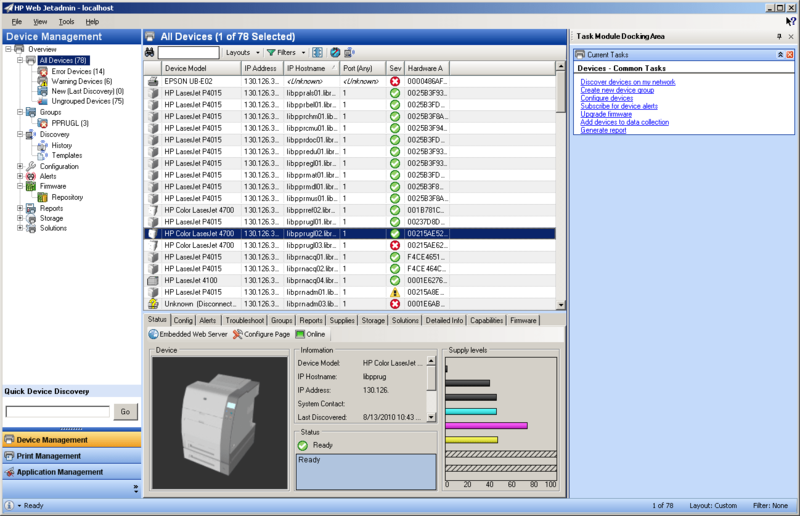 HP printers offer a web interface to see things like toner levels, tray levels, page count, and change printer and network configurations and is what we’ve been using for as long as I can remember. Web Jetadmin can allow you to access all of those things from a single interface and can also interact to varying degrees with different manufacturer’s networked printers. It will also work with some PC attached printers. 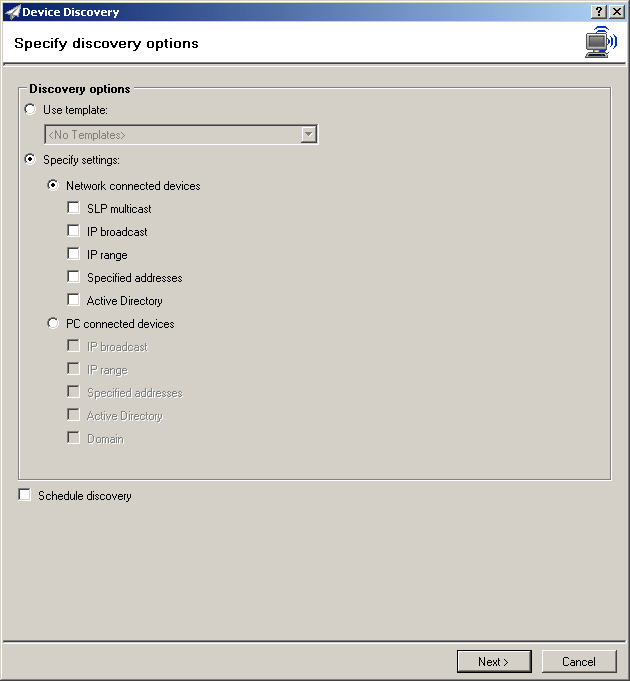 The first step to take after installing the software is to runt through the discover devices process. This goes out across the network as you specify to find the different networked or PC connected devices that Web Jetadmin can understand. With this functionality, Web Jetadmin can minimally double as an asset manager program. Once the scan is run, you should hopefully have a populated list of the printers you can interact with through Web Jetadmin. 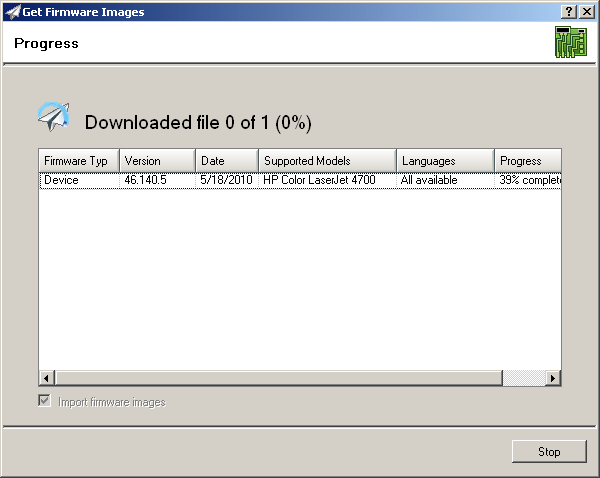 One particularly nice capability of Web Jetadmin is how it simplifies the process of updating a printer’s firmware. Without, the process can be tedious and unreliable. Web Jetadmin simplifies the matter into downloading the firmware from a catalog within the software (no more combing the HP support site) and then you import the device or jetdirect firmware updates into the repository. Once the files are in your repository, you can easily select a compatible printer from your discovered devices and initiate the firmware update. The Web Jetadmin provides device management, print management (for your print server), and application management. For me, I spend most of my time inside the device management portion administering printers and checking their status/errors. The ability to check the toner and page levels easily might have me sharing this towards the help desk or individuals in a unit that order supplies. One cool implementation of the HP Web Jetadmin stems from another service HP provides through their Printer Assessment Services. I have heard this was free for non-profit and education organizations that HP will come in, setup Web Jetadmin to monitor your printers for 30 days and then come back and help you set up a plan to optimize your printer environment to find what scales with your organization correctly. This can help supply ammo for any necessary reductions as well as reduce your carbon footprint resulting from printing. The information you can pull from non-HP printers is limited and varies per brand and model but it seems to be improving with each subsequent version. Right now it’s still pretty easy to just pop into a single printer’s web interface to figure out if there’s a problem but when working with batches Web Jetadmin should make it easier and it seems like it will also simplify the training process of showing how to check a printer remotely.